Guitar Making Tip No. 850 is about inlaying squares. Circles are by far the easiest type of inlay, because if you can drill a hole, you can inlay a circle. However, squares are not that difficult, and you can inlay them easily too. One of the most frustrating things that you can do as a luthier is inlay. This is a common part of making a guitar, because inlays are expected to be in certain areas, but the skill is different. Inlaying is not the same as guitar making. When you think of them as different skills, you give yourself more of an opportunity to learn. There are a lot of square inlays that are sold in guitar making supply catalogs, and there are also diamond shapes too. These are the second easiest kind of inlay, because you can do the entire process with one tool. Abalone diamonds, which are actually squares, are one of the most common square shapes that you can inlay. These are inexpensive, and can give a really cool look to the fretboard when you inlay them for markers. Thankfully, the process only involves a chisel. If you are careful, and work on each inlay one at a time, you can do the process well even on the first try. The only thing you need to know is the trick to making the cuts perfect every time. The trick to square inlays is to modify your chisel. If you are doing 1/4 inch wide inlays, then you need a 1/4 inch chisel. If your inlays are a lunch less than 1/4, then you need a 1/4 inch chisel and a grinder or sander. Chisels are inexpensive when you buy the hardware store type. Pick up a decent hardware store chisel, and modify the tool. Measure out the ends of the inlay, and then sand down or grind down the chisel to be the same size. When you have a chisel that is the same size as the piece, all you need to do is punch through the wood on the four edges. Excavate the insides, and then you can inlay the piece. Since the tool is the perfect size now, your work is greatly reduced, and the cavities will be effect size too. Your homework is to get over your fear of inlaying anything other than circles and try something new. If you are already an established inlay artist, maybe you try modifying a tool or two to make the job easier? 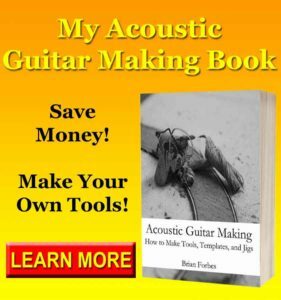 Either way, adding more tools and adding different skills will make you a better inlay artist and a better guitar maker too. Buy chisels that are not completely on the bottom shelf, but somewhere in the middle. Once you have the chisels that are close to the size of your inlay pieces, just grind or sand them down to match. Obviously you need to get chisels that are larger than the inlay, but also look for pieces that don’t require you to sand away half the steel. 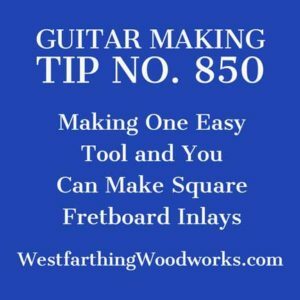 Guitar making tip number 850 is about square inlays. It’s easier to inlay round shapes, but square shapes are easy too. If you modify you chisel, the process becomes a walk in the park, and you can add another type of inlay to your design options. Find a middle of the road home improvement store chisel, and modify it on the belt sander or grinder. Remove material from the side until it is the same width at the inlay piece that you are working with. Next, all you need to do it use that chisel to break through the wood for the four edges of the square or diamond. 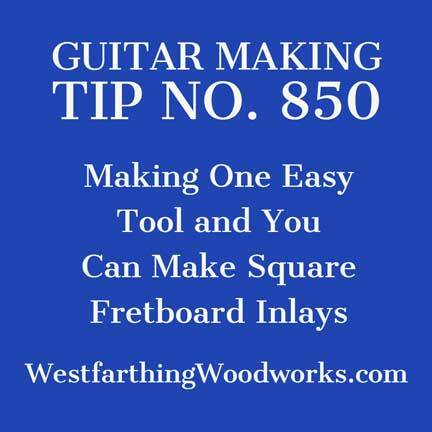 Make another pass to remove the waste from the middle, and you have a cavity that is perfect for a square inlay.